This site is being built gradually, please check back again soon. 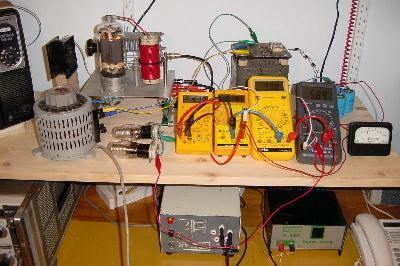 This picture shows an 813 based Hartley oscillator transmitter being tested with a makeshift power supply. This transmitter was intended for the 160m (1.81-2.0 MHz) Amateur Radio band. I dismantled it after a slightly disappointing period of testing and made another version using an 812A triode. This one works a whole lot better. You can read more about this project and some others on my projects page.